Built to your custom specifications. And our high standards. Our Transit-Liner® C2 commercial bus is incredibly versatile. Thomas Built can customize it to meet your specific needs, including features like coach-style seating, overhead roof racks, video systems and tinted windows. Years ago the C2 set the industry standard, with outstanding maneuverability, state-of-the-art driver ergonomics and the most visibility among all Type C buses. It’s built to the same standards as a school bus, providing long-term durability with all-steel construction. Other commercial buses simply don’t meet those levels of quality. At Thomas Built Buses, we know our customers want to get the most out of their transportation budgets. That’s why we build our city and commercial buses to a higher standard of durability. 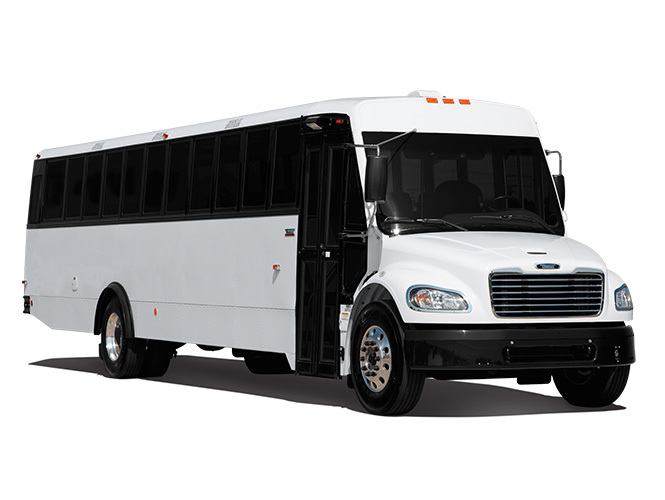 Thomas Built is pleased to offer a base warranty of three years or 50,000 miles on the Saf-T-Liner C2. This warranty covers the chassis, electrical and manual controls, safety equipment, assemblies and more. Normal wear items are excluded.